SOG FastHawk Fielder Kit contains the tools you need for hunting big game, general camp craft, as well as outdoor survival. 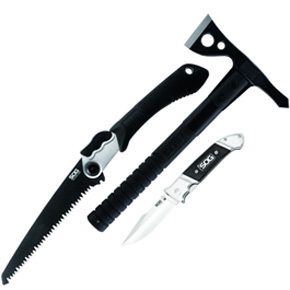 The kit contains a FastHawk Tomahawk; a Fielder G-10 folding knife; and a Folding Saw. The tomahawk has a tough and versatile 420 stainless steel head with a cutting blade and a piercing point on the back. A ballistic polymer handle provides a positive grip. This is a great tool for chopping, digging, and hammering. Includes a nylon sheath. The Fielder G-10 folding knife has a 5Cr15MoV stainless steel blade with a full belly, a false edge on the spine, dual thumb studs, and an extremely sharp point. The lockback prevents the knife from folding during use. Thumb serrations, a finger guard, and G-10 scales provide a non-slip grip. The Folding Saw has a high carbon steel blade with aggressive teeth for sawing through wood. The handle is made of steel and TRP soft grip. Includes a ballistic nylon sheath.